“Inmate #1: The Rise of Danny Trejo”, currently in production in California, explores the life and career of Hollywood’s most unlikely hero, Danny Trejo. Trejo, whose myriad of TV and motion picture work includes Desperado, Machete, Sin City, Predators and Sons of Anarchy, executive produces alongside proficient producing team Adam Scorgie, Rocky Mudaliar, Iliana Nikolic and Craig Balkam. From an early life of drugs, armed robbery and hard prison time, to the red carpets of Hollywood blockbusters all the way to helping troubled addicts; Trejo gives a firsthand account of one of the greatest transformations of human character ever put to film. Upon his release from prison in 1969, Danny’s life took a turn for the better. He started counseling teen drug addicts and working as a boxing coach. One chance meeting led to another and eventually, he found himself on the set of Russian director Andrei Konchalovsky's Runaway Train (1985), where he was hired to train the film’s star, Eric Roberts how to box. During the course of his illustrious acting career, Trejo has worked with such heavyweights as Quentin Tarantino, Antoine Fuqua, Michael Mann, Ivan Reitman and Robert Rodriguez. Trejo recently completed filming Death Race : Anarchy and western Dead Again in Tombstone, both for Universal Pictures. 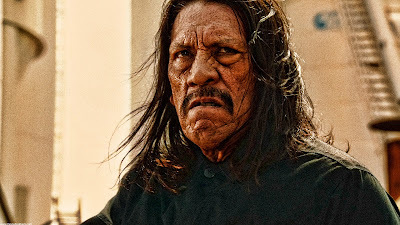 Shortly, he’s expected to reprise his trademark role of Machete in a second sequel to Robert Rodriguez’s cult classic. Inmate #1 : The Rise of Danny Trejo is currently shooting for a release fall 2018.